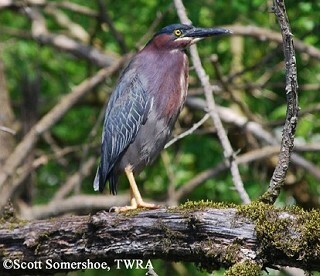 The Green Heron is the most widely distributed and probably the most abundant wading bird in Tennessee. It is a small, stocky, dark colored heron found foraging along streams, and shorelines of ponds and lakes. It can be difficult to spot because it stands motionless, body lowered and stretched out horizontally, waiting for small fish to approach within striking range. It occupies freshwater habitats from southern Canada through Central America, avoiding the higher and drier areas of the continent, and winters in the southeastern United States, Central and northern South America. Description: The overall impression is that this is a small dark heron. In good light, it is possible to see that adults have a dark cap on the head, a dark iridescent, greenish-blue back, and a dark, rust colored neck. The legs are yellowish, the bill is long dark and pointed, and the neck is often kept pulled in tight to the body giving the bird a stocky appearance. Juvenile birds (July-March) are brownish overall with a dark cap and a brown-and-white streaked neck. Males and females look similar but females are slightly smaller and duller. Voice: Call is a bold, loud single skeow, often given in flight. American Bitterns are much larger, a more golden brown and lack the dark cap. Least Bitterns are smaller, slimmer, have a large pale patch in the wing, are pale below, and are rarely seen away from thick marsh (cattails) habitat. Immature Black-crowned night-herons and Yellow-crowned Night-herons are larger and more robust with thicker bills. Habitat: Streams, ponds, small lakes, and large reservoirs. Diet: Small fish, invertebrates, insects, frogs, and other small animals. Nesting and reproduction: Unlike most herons, the Green Heron is typically a solitary nester or nests in small, loose colonies of less than 10 nests. Clutch Size: 4 to 5 eggs are most common in Tennessee, with a range of 3 to 6 eggs. Fledging: Both parents regurgitate food for the young who are able to climb into tree limbs at about 10 days, and start to fly at about 21 days. The parents continue to feed the young until they fledge after about 30 to 35 days. Nest: The male starts the nest, bringing long, thin sticks to the female who finishes the nest. The nest is a thin platform placed in small trees or shrubs, usually near or over water and may be reused in subsequent years. Nest heights in Tennessee have ranged from 3 to 40 feet above the ground. Status in Tennessee: Green Herons are a fairly common summer resident across the state at lower elevations. They usually arrive by late March or early April and depart by early November. According to Breeding Bird Survey data, their numbers appear to be declining. The Green Heron is one of the few birds known to use tools. They attract prey with bait (feathers, small sticks, or insects) that they drop into the water and grab the small fish that are attracted. Best places to see in Tennessee: This species may be found at the edges of many lakes, ponds, reservoirs, and streams in any county of the state, between late March and early November. Davis, W. E., Jr., and J. A. Kushlan. 1994. Green Heron (Butorides virescens). The Birds of North America, No. 129 (A. Poole, and F. Gill, eds.). The Academy of Natural Sciences, Philadelphia, PA, and The American Ornithologists' Union, Washington, D.C.